I lucked into a brand new unused Harsch crock at Goodwill a while back. I just put up my first batch of sauerkraut for the season on Saturday. Two large heads of green cabbage and kosher salt and a little bit of leftover kraut juice from a previous batch. It was bubbling actively by Sunday afternoon. Fermentation rules. Err, I’ve had to move the kimchi outside....fermenting cabbage is powerful stuff ! I think I'll call it "clean out the crisper drawer salsa." 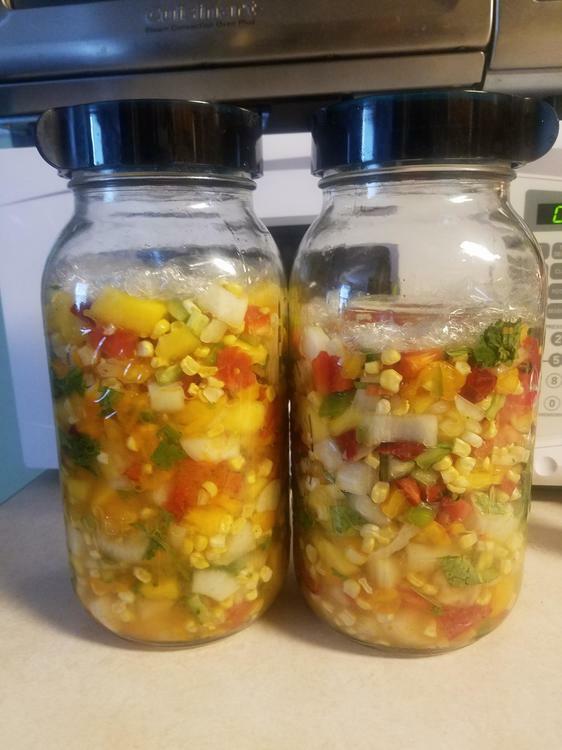 Yellow tomatoes, red tomatoes ( @Shelby, I peeled the damn tomatoes), serrano, Anaheim and red bell peppers, onion, mango, kernels from four ears of corn, cilantro. It'll ferment for 2-3 days and then I'll likely can it to go in Christmas baskets. Peppers were hotter than I thought. Hands are burning! I lost my semi-dehydrated tomatoes when we were without power for three days so I re-did them and froze a bunch of fresh ones too. They are handy when you only need one or two. Today I made apple butter from my in-laws apple trees. They have some really old apple trees, no one knows what kind they are but the apples make terrific apple butter. 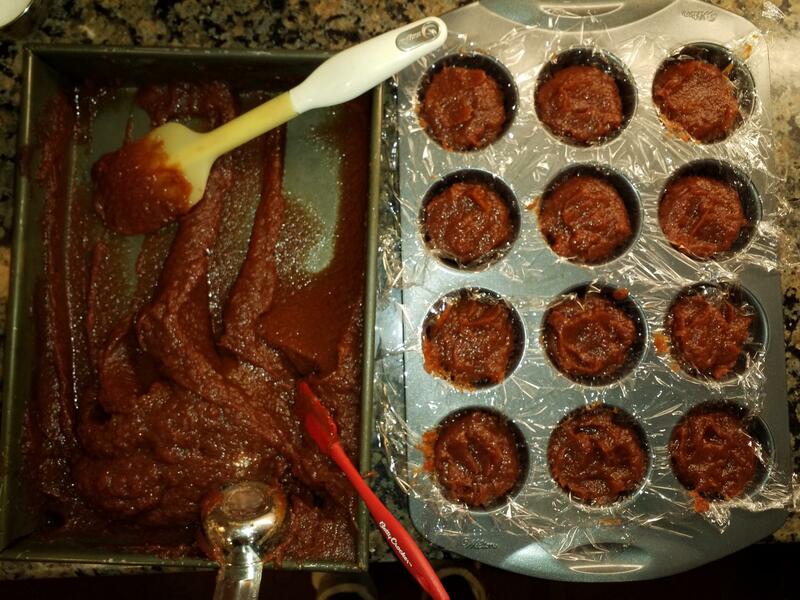 I freeze it in 1/4 cup portions in muffin tins. Goes well with pork. 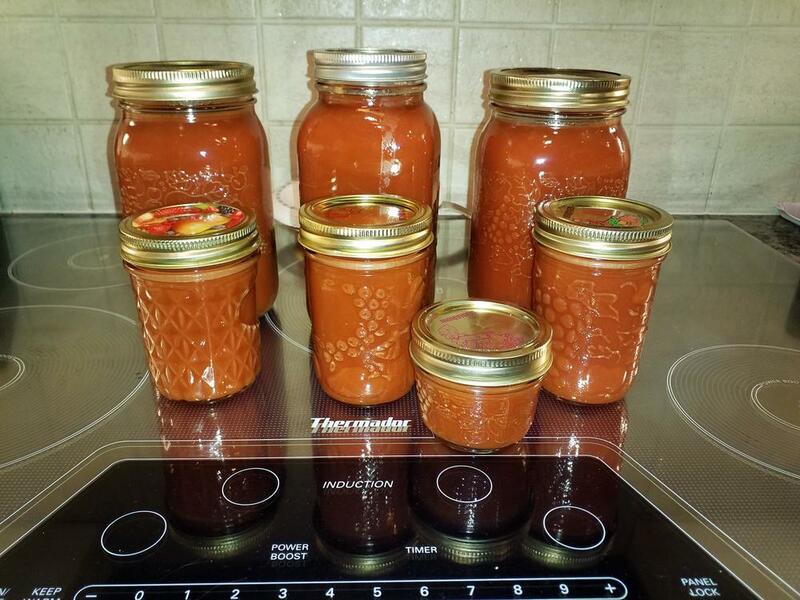 Today I also made almost 4 quarts/litres of hot sauce, made using Sugar Rush Peach Peppers. My crock of Sauerkraut is now in my garage, I started it mid August using Polish cabbages (like cannonballs) , we have a lot of Polish shops in England now. the cabbage when shredded came to about six kilos, a couple of apples and some finely shredded new carrots. the cooler weather is here and it will be on top form by the end of November and will stay in good condition until it is all used up , usually about May, i put up a few handfuls in a plastic container and keep it in the fridge, it is lush, not stinky but fragrant and flavoursome. I grew up on a farm and we grew acres and acres of cabbage. But we never made our own kraut. We sold to distinctly ethnic neighborhoods markets (Polish, Jewish, Yugoslavian, Russian etc). The demand for the "kraut cabbage" came late in the season, after the frost. The cabbages were heavy, hard, and the frost made them sweeter. An earlier cabbage could have a "hot" flavor and the leaves were light and loose. There were many people that had the old kraut barrels in their basements and would buy crates of cabbage for the winter. This wasn't all that long ago even though it sounds like pioneer times. I just started making kraut maybe 3-4 years ago on a whim. I cannot get the after frost, heavy cabbages here locally. 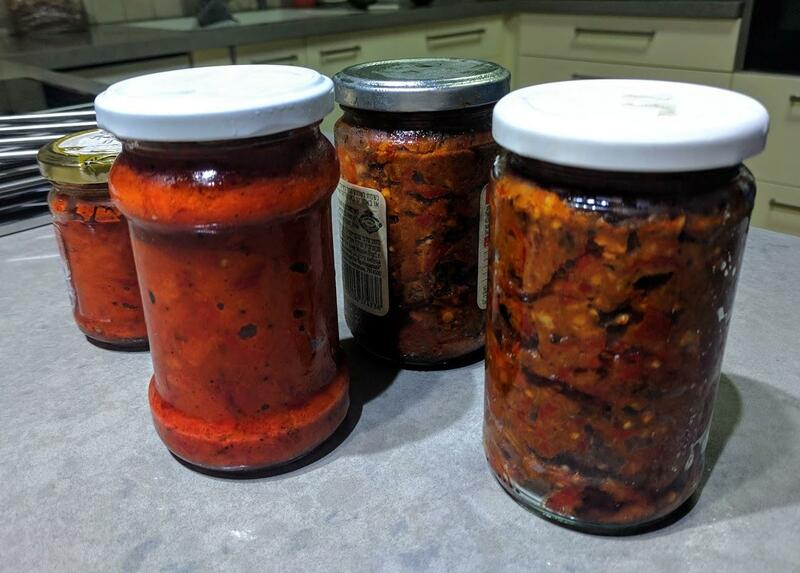 Romanian style eggplant and pepper preserve. I brined another beef tongue for three weeks in a solution of Morton Tender Quick. I took it out of the fridge today and cooked it in the Ipot for 70 minutes. Here it is still in the cryovac. And here it is starting it's three week bath. Here is what it looked like when I pulled it out of the brine today. Into the Ipot with water to cover, more bay leaves, a splash of cider vinegar and several splashed of Crystal hot sauce. Out of the Ipot after 70 minutes with Natural release. And here it is peeled and headed back to the fridge to chill before use. You will probably be seeing this appear on the lunch thread, but definitely not dinner, as this operation is a covert one that will bring a rolled eye and a muttered "Oh, brother! ", if discovered. You﻿ will probably be seeing this appear on the lunch thread,﻿ but definitely not dinner, as this operation is a covert one that will bring a rolled eye and a muttered "Oh, brother! ", if discove﻿red. I love tongue and was brought up on it but I have to admit that I prefer to see it sliced and in deli wrap. So many of the items that I was raised on and that seemed perfectly normal often strike me now as having a definite yuck factor. I am thinking of tripe and black pudding and fish roe. All of these were rare treats and I gobbled them up. Only as an adult did I learn their origin. I feel that way about smoked eel. My crabapples became a relish, a chutney and some jelly that I reported above. The crabapple/pecan relish, after being eaten out of hand and sprinkled on salads, made its way (what was left of it) into some puff pastry as a dessert. 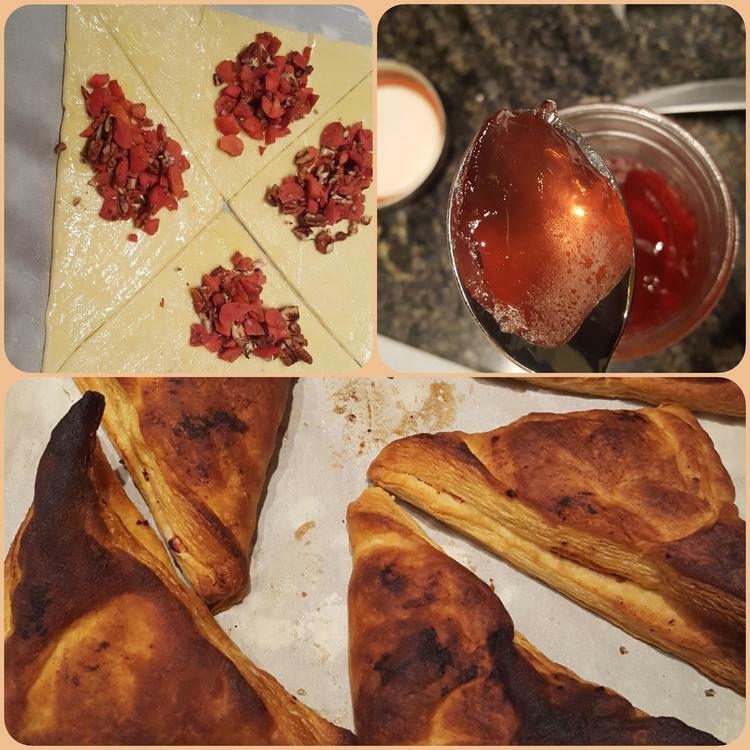 I've never worked with puff pastry before, and thought it was a bit too brown - and needed a bit of jelly to set it off. Our dinner guests loved both the jelly and the pastries, and only one other used the jelly. @HungryChris I've been up since 3 this morning so forgive me if this is a dumb question--I'm a little loopy lol. I bought a bunch of mushrooms yesterday so I can make your marinated ones today (our hunter comes next week and I think he'll love them). I have a bunch of the marinade (brine? juice? lol) left in my jar. Do you ever re-use it or should I just start from scratch? Probably best to wait for HungryChris to reply but I'm pretty sure he has re-used the marinade/brine for his marinated mushrooms. The hunter is returning, more posts in @Shelby's hunting blog!!! Thanks so much! The grocery store was a ZOO yesterday --I had to shove my way through a crowd to get to the mushrooms. I'm happy I came out alive. I reuse random pickling brine all the time as long as I left it in the fridge. Haven't noticed anything "off" or weird yet. Yes, I have reused it. It works fine the second time around. One thing -- the first time I ever bought pumpkin for savory eating -- 1995 or so in Somerville, MA -- they were 25 cents apiece. Now, at 1-2$/pound, I just can't think of them as a cheap vegetable anymore. I refuse to run out of Chris' mushrooms. @Shelby, That is the way to do it!!!!!!!! Soooooooo, I am obsessed with these mushrooms lol. I cannot stop eating them. I made a jar for my brother and sister in law for their Christmas basket. Today I scored 6 more boxes of mushrooms for 99 cents a piece!! !